Here in Arizona, we can enjoy the temperatures all year round. Many residents are choosing to have a staycation in their own backyard instead of taking a vacation to an expensive resort. Staycations come with plenty of perks. You don’t have to travel and you spend less, so why go far when you can live it up at home on your very own backyard staycation? 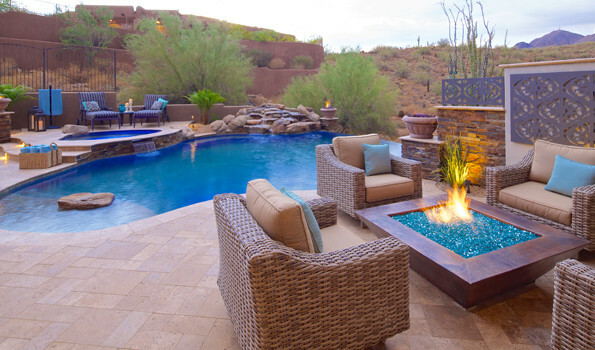 Unique Companies have created relaxing, resort-style outdoor living spaces that are perfect for hosting parties or spending time with family. Until recently, Lazy Rivers have been exclusively a resort or water park amenity. Typically a snake-like pool runs through lush foliage with an occasional swim-out or water curtained grotto. This lazy river feature which excites kids, and relaxes the rest of us is now becoming a very popular amenity for residential swimming pools. 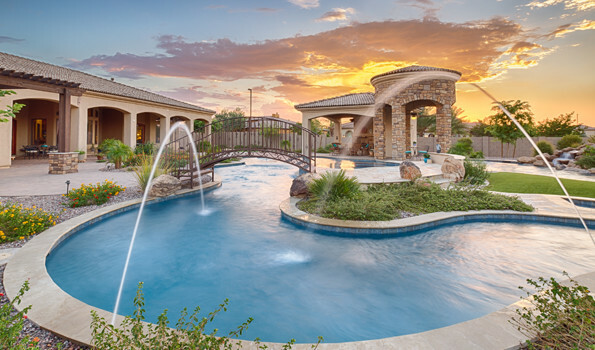 That magical sensation of weightless motion, the allure of an Island and the charm of a foot bridge are compelling elements to consider in a back yard lazy river. The added décor pulls everything together creating the perfect at-home water park. We had fun designing this sleek and stunning gas fire pit with beautiful, blue tumbled glass along side a free form pool with travertine decking, baja lounging step, raised stacked stone spa and waterfall feature. An Arizona gem. 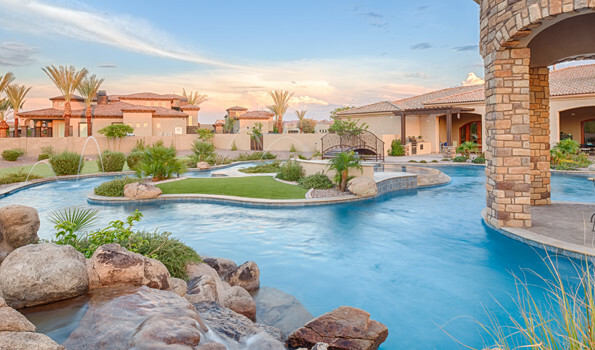 “The Matson Project was a pretty sweet project,” Chris Griffin (the owner) said, as he reminiscences about how his company—Unique Landscapes & Custom Pools—transformed an Anthem backyard into the spectacular outdoor spa and entertainment complex pictured above. Water, fire and glass were the dominating themes of this makeover. With the goal of taking advantage of the amazing view of the Anthem Country Club Golf Course, the spa was raised, and a 300 square-foot Ramada and fully stocked kitchen filled with stainless steel appliances. 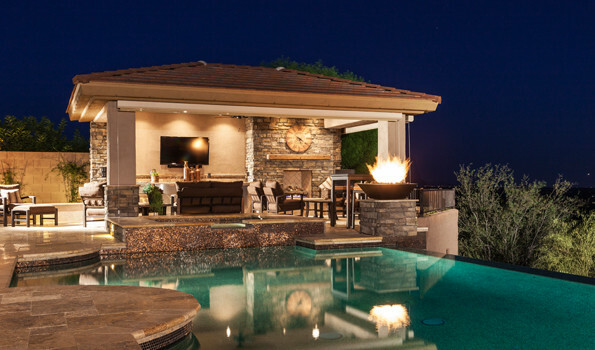 This backyard is definitely the best for outdoor entertainment.